The Shinari concept, which roughly translates to “resistance to being bent,” will serve as a the basis for Mazda’s new design language, and many of the styling cues will make it to future production vehicles. That means that the Shinari will essentially affect the design of every vehicle coming from the Japanese automaker for the next several years. An important car for Mazda? You bet. The Shinari was officially unveiled earlier today, and we spent several hours talking with Mazda’s artists about the design and how it will affect the automaker’s forthcoming vehicles. The creation of the Shinari Concept starts with Ikuo Maeda, Mazda’s global head of design. Maeda was the chief designer of the RX8 and Mazda 2 and has been with the company for nearly 30 years, but his connection with the brand goes back even further than that. His father, Matasaburo Maeda, headed the design of the first generation RX-7 back in the 1970s. Mazda runs in the Maeda family’s blood and there’s no one more qualified to define the look of Mazda’s next generation vehicles. While Maeda created the theme for the new stylistic direction, the development of the Shinari Concept was actually a collaboration between three of Mazda’s design centers in Japan, Germany and the United States. The goal was to make the exterior a product of Japan, while the interior was left to the automaker’s Irvine studio. However, each team had input on the final product. Looking at the exterior, it’s easy to tell that the Shinari shares little in common with Mazda’s recent designs, although like almost every sedan built today, it has similarities to vehicles from other brands. It’s almost as if the Aston Martin Rapide and a Mazda RX-8 cued up some Barry White, enjoyed a romantic evening and the Shinari came out nine months later. That’s obviously a compliment, as the Rapide is a stunningly beautiful car and the RX-8 – even this far into its lifecycle – is still a looker. However, the Shinari has a much more complicated design, with more intersecting lines and a surface area that’s constantly moving and changing depending on the lighting. While the exterior is certainly a departure from previous designs, the interior is perhaps the most surprising aspect of the Shinari. Easily the most attractive and stylish interior we’ve seen in a Mazda (concept or not), it’s swathed in authentic aluminum trim, leather-covered surfaces and double stitching at nearly every turn and twist. We’re again drawn to the Aston Martin Rapide comparison, especially with the design of the deep rear bucket seats. The gauges, modeled after popular watch designs, up the class quotient and the massive glass roof helps make the interior feel open and airy. One thing that can definitely be seen in future Mazda interiors is a driver-focused cockpit. A close look at the Shinari’s interior reveals an asymmetric design that snugly surrounds the driver’s seat while leaving the passenger seat more open and relaxed. Jenkins says this will be theme of upcoming Mazda vehicles and help set the brand apart. Finally, the Shinari also features quite a bit of technology that looks forward to the new applications of driver-automobile interactions. The Human Machine Interface (HMI) is split up into three modes: Business, Pleasure and Sport. Potential uses range from looking up bios of a business contact before a meeting to a rally-style co-pilot feature that could alert the driver of the characteristics of upcoming turns. It’s nothing too far-fetched given the current levels of technology, and we wouldn’t be surprised to see some of it implemented in the near future. But more than the tech and the attention to detail, it’s the Shinari’s overall cohesion that impresses the most. Unlike other pie-in-the-sky concepts, the Sinari is a smart, well executed styling exercise that should be a solid design platform for future models. The muscular lines should translate well into a production car, and customers will always appreciate a more sophisticated interior. And what about the potential of a four-door sports coupe like the Shinari making it to production? Mazda wouldn’t tell us whether one is in the works, but they did mention that the “business side of it” was considered when the Shinari was under development. That definitely means there’s a chance, and we sure like the sound of a Mazda RX-9. Tracktest Mazda RX-8 with Patrick Simon in HD quality. A homemade video representing Mazda RX-8 40th Anniversary Edition. I love the special red/black sport seats. 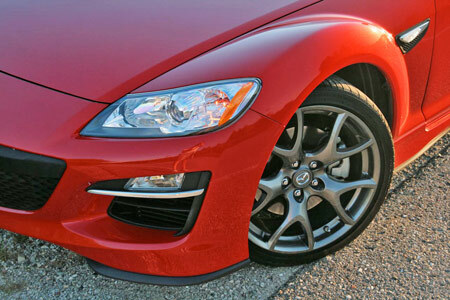 Top Gear has reviewed the Mazda RX-8 1.3 231bhp in comparison with the Audi TT 2.0 TFSI and the Alfa Romeo Brera 2.2i . Though they consider the Alfa to be the best looking, i think the RX8 shapes make it more beautifull. Charts showing power and torque results on dyno tests for the stock Rx8 (manual 1.3 231 Bhp) versus Greddy turbo, SFR turbo, Pettit supercharger, Mazdatrix supercharger, Mazsport turbo, PTP turbo, MazdaManiac Greddy turbo upgrade and Esmeril turbo kit. 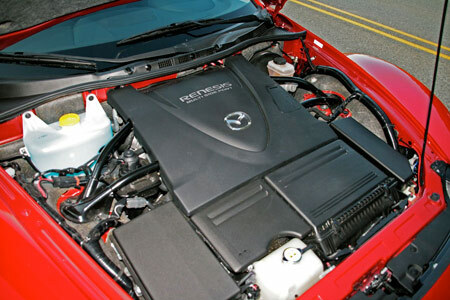 The power for the turbocharged kits is between 293 WHP (Greddy kit) and 366 WHP (Esmeril kit), and between 271 WHP (Pettit) and 276 WHP (Mazdatrix) for the supercharged versions. Since 1991, legendary Formula One driver Johnny Herbert has had a deep affinity with Mazda. He won the Le Mans 24 Hours in a Mazda 787B. And now he’s back behind the wheel to put the stunning Mazda RX-8 R3 through its paces. From Britain’s junior karting champion to Formula One winner - Johnny Herbert has always been a rising star in the racing world. In 1987 alone he won five Formula Three races and claimed the championship at his first attempt. But a shunt at a Formula 3000 race at Brands Hatch led to disaster, when Johnny collided with the barriers and broke both legs. Despite the severity of his injuries, he made his Formula One debut just a few months later - finishing fourth in the 1989 Brazilian Grand Prix. After a few years out to make a full recovery, Johnny was invited to drive for Mazda in the 1991 Le Mans 24 Hours. His win at this legendary endurance race marked an important first for Mazda. Four years later, he celebrated another impressive victory at the British Grand Prix when, after a virtually error-free drive, he finished in first place. Since retiring from Grand Prix racing, Johnny has concentrated on sports car events. He recently won the first season of the 2008 Speedcar Series. The Le Mans win was the result of years of research and development by Mazda - and this is immediately noticeable once you’re behind the wheel of the Mazda RX-8 R3. Just like the victorious Mazda 787B, the Mazda RX-8 R3 is powered by an award-winning rotary engine, which takes you from 0 to 62mph in an electrifying 6.4 seconds. 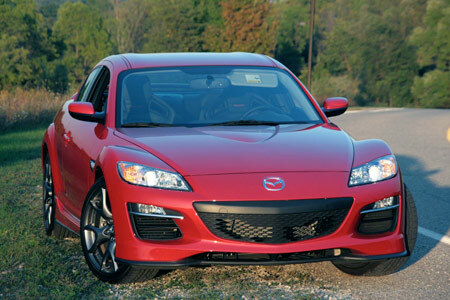 Power and performance - the true indicators of Mazda sports car pedigree - are abundant in the Mazda RX-8 R3. And don’t forget those outstanding driving dynamics and the breathtaking halding capability.